Amongst some of the most important horse tack for traditional Portuguese equestrian sports are the Portuguese saddles. The traditional Portuguese saddle model, known as “sela Portuguesa” or “sela à Portuguesa”, which one can see below, has evolved from the XVIII century saddle. The Portuguese saddles from the Lusitano brand are handmade in Portugal and most of the materials used today are similar to the ones used in the past. Some differences can be found though, for instance today the Lusitano brand saddles have the tree saddle in maritime plywood with the advantages of increased resistance and flexibility. Apart from this traditional Portuguese saddle model there are also a few other traditional Portuguese saddles, where one of the best known is the “Relvas” saddle. Newer Portuguese saddle models have been also developed based on the design from those traditional ones such as “D. Dinis” saddle, “Portuguese equitation” saddle and “Ribatejo” saddle, being examples of the innovation on Portuguese saddle-making. For more information in a particular Portuguese saddle model just follow the links provided in this page. If you are interested to purchase a Portuguese saddle you are welcome to visit our online shop under the sub-category Portuguese saddles. Portugal Web has created the Lusitano brand which is a trademark to acknowledge that all saddles are crafted in Portugal following the Portuguese saddle making tradition. 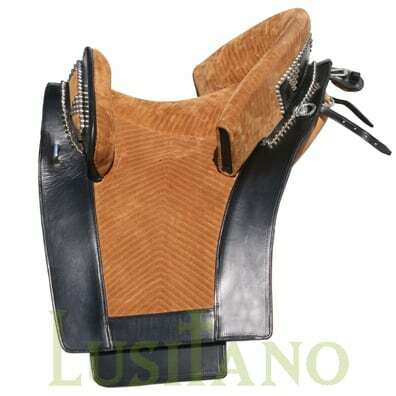 Since all Portuguese saddles are handmade if required they can be therefore customized for the rider and for the horse. In addition, Portugal Web is not limited to the saddle models on display as its also able to provide horse tack based on a proposed design. For instance, the craftsmanship expertise at Portugal Web is able to supply specific show saddles and bridles. In this case it will be required that all the details about materials, sizes and design are provided.